The Montreal Canadiens came up huge last night on home ice in what was the biggest game of the season (that is, until Thursday’s game versus the defending champs). Artturi Lehkonen and Max Domi popped in third-period goals to give the Habs a 4-2 win over the league-leading Tampa Bay Lightning, keeping the Canadiens within reach of a wild-card spot in the Eastern Conference. The Habs are now tied with the Blue Jackets after Columbus lost 6-2 to the Boston Bruins. Both teams are one point back of the Carolina Hurricanes, who jumped all over the Toronto Maple Leafs 4-1. If Montreal fans need any more indication that anything goes during a playoff push, Canadiens fans were rooting for both Toronto and Boston last night, in hopes that both rivals could tame Columbus and Carolina. The Habs and Blue Jackets both have 94 points with two games apiece left to play, but Columbus currently holds the last wild card spot and the tiebreaker. Meaning Thursday’s game in Washington will be big, likewise so too will be the Habs’ final regular season game on Saturday at the Bell Centre against who else? The Leafs. As Carey Price stopped 22 of the 24 shots he faced against the Lightning, the Canadiens 43rd win of the season was the biggest so far and the Bell Centre was buzzing throughout. 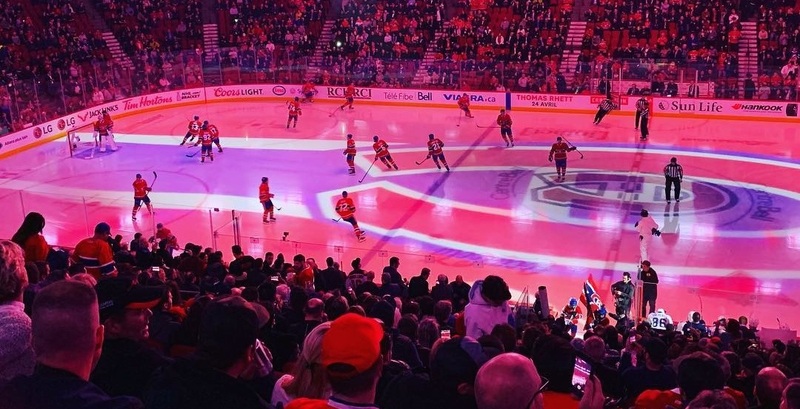 We’ve put together some videos and pictures showing how electric the Bell Centre was last night as we rooted on the bleu, blanc, et rouge as they (hopefully) make their final push towards the NHL playoffs.